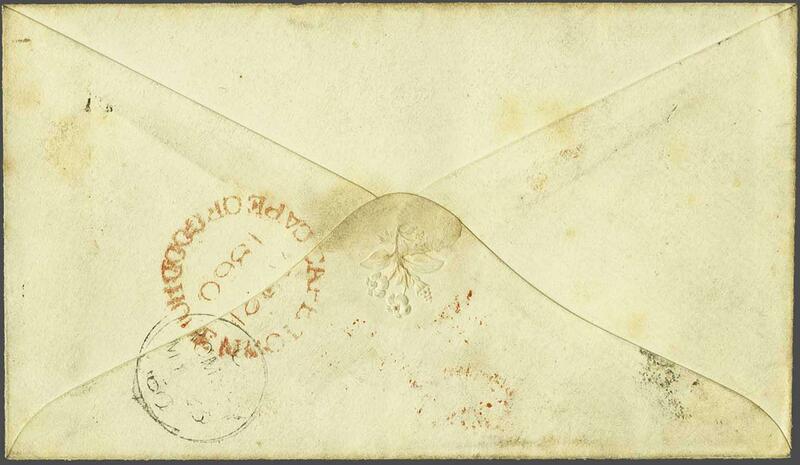 1855/63: 4 d. blue on white paper, a used example with clear to large margins, used with two 1 d. rose on cream paper in differing shades and also with large margins all round, on 1860 cover endorsed 'Per R.M.S.Athens' to Romsey, Hampshire tied by three strikes of the CGH obliterator in black and by '5' rate credit in red manuscript. 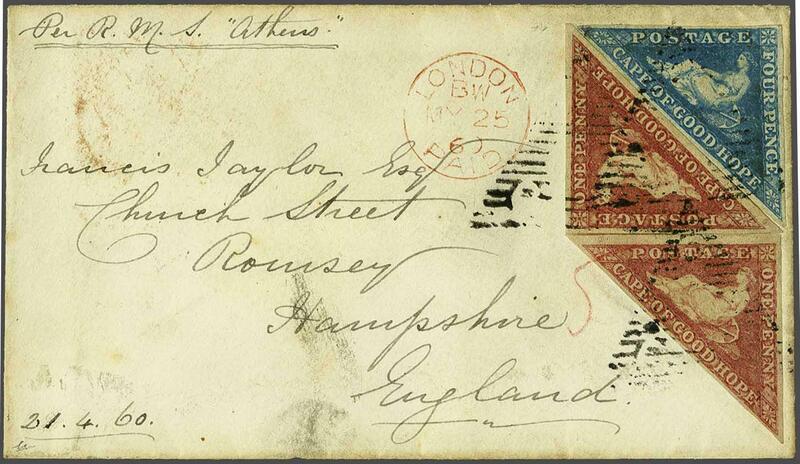 Reverse with CAPE TOWN / CAPE OF GOOD HOPE circular datestamp (April 21) in red and Romsey arrival cds (May 23) in black. Obverse with 'London / Paid' transit cds in red (May 25). A splendid and fine cover.rnrnNote: This correspondence to Romsey was first offered in RL, Bournemouth, 7 July 1972.rnrnNote: The Royal Mail Ship 'Athens' was an iron steam screw barque of 739 tons, built in 1856 by Denny of Dumbarton and operated by the Union shipping company. It was wrecked between Mouille Point and Green Point on 17 May, 1865 at night, after the boiler fires were extinguished by heavy seas during a north-west gale whilst trying to steam out of Table Bay. The wreck is still visible.